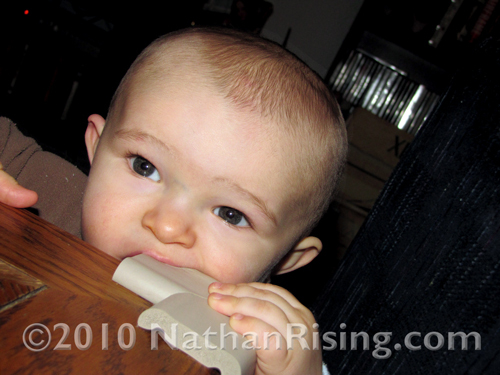 He’s teething again… and biting anything and everything he can get those teeth on! We have all kinds of teethers that he can bite on, but he won’t use any of them. He prefers to nom on HIS OWN FINGERS and will even leave little teeth marks on his skin as evidence of his misery. Or he teethes on stuff he shouldn’t… like the coffee table. Or his crib rails. OR MY CHIN (yeah, that wasn’t very pleasant). This entry was posted by Jen on February 17, 2010 at 9:33 pm, and is filed under All About Nathan. Follow any responses to this post through RSS 2.0.You can skip to the end and leave a response. Pinging is currently not allowed. .-= Falling´s last blog ..Life in the Big House =-. That’s hilarious! Those teeth can sometimes feel like miniature daggers! Oh, the things babies do when they’re frustrated. Aside from biting when things don’t go his way, Nathan will also shove whatever toys are nearby away from him. And then he’ll dramatically throw his arm over his eyes and bawl. Those little teeth marks on his fingers break my heart, but I have tried and tried to get him to teethe on other things… but nothing works. Poor little guy. Biting my chin… not so pleasant either! He just looked up at me and leaned in really close like he was about to be sweet, and *WHAM! * bit the crap out of it.